After landing in Las Vegas, we picked up our rental car and drove east to the Hoover Dam. Sitting over the Black Canyon of the Colorado River in between the states of Nevada and Arizona, the Hoover Dam is probably the most famous dam and hydro electric station in the US. 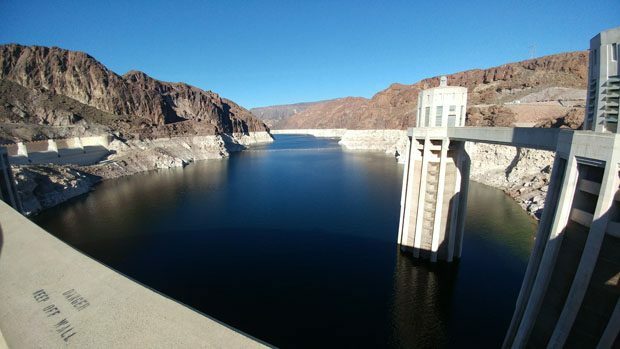 The dam impounds Lake Mead, which is the largest reservoir in the US by volume when full. 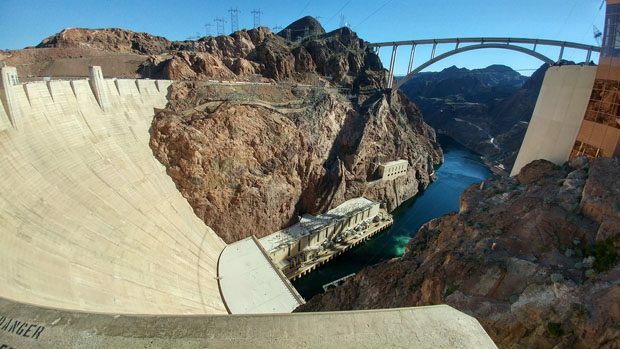 Hoover Dam was completed in 1936 and is still a pretty impressive piece of engineering and construction. Hoover Dam is a popular tourist spot, and there were plenty of visitors when we arrived. We arrived too late to take the guided power station tour, so we just walked on top of the dam instead. The dam is over 200m tall, so it is pretty far up from the bottom of Black canyon. 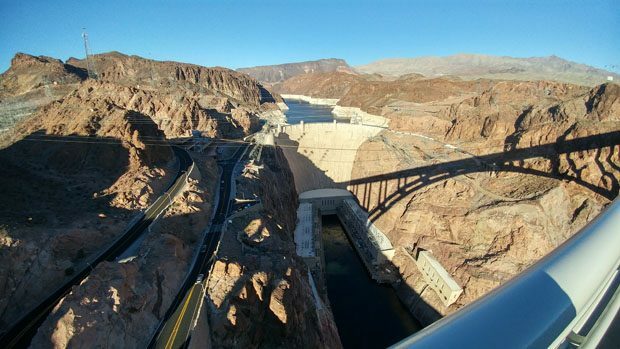 Up until 2010, US Highway 93 between Arizona and Nevada actually ran on top of Hoover Dam. Nowadays, US 93 along with Interstate 11 run on the Mike O’Callaghan-Pat Tillman Bridge, aka the Hoover Dam Bypass, that straddles Black Canyon a short distance south of the dam. We took a short walk onto the bypass and got a pretty good elevated view of Hoover Dam in all its glory. The next destination on our trip was Grand Canyon National Park. One of America’s most famous natural landmarks, the Grand Canyon stretches across Arizona and is the product of millions of years of erosion by the Colorado River. The eastern portion of the canyon is protected by the Grand Canyon National Park. Like most visitors to the Grand Canyon, we drove to the South Rim which has most of the visitor facilities. The Grand Canyon village area is has the visitor center, park HQ, lodging, shops and of course numerous vista points of the Grand Canyon. The South Rim facilities cover enough of an area that there are numerous shuttle bus routes to ferry visitors around. We arrived pretty early, so there wasn’t too much of a crowd. First thing we noticed after getting out of the car was how cold it was. 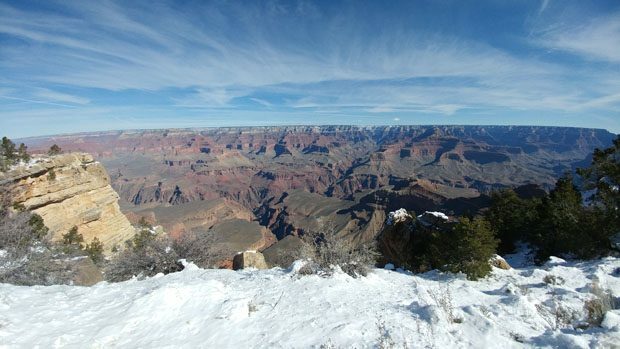 Arizona is known for its blistering hot temperatures in the summer, but when we went to the Canyon, there were still snow on the ground, and the winds in the morning made winter clothing a necessity. We braved the wind chill and made it to the Rim Trail at the edge of the Grand Canyon, and got plenty of good looks at the majestic landscape. The Grand Canyon is certainly very grand. The scale of the Grand Canyon is just so massive that I couldn’t help but feel how small I am in comparison. 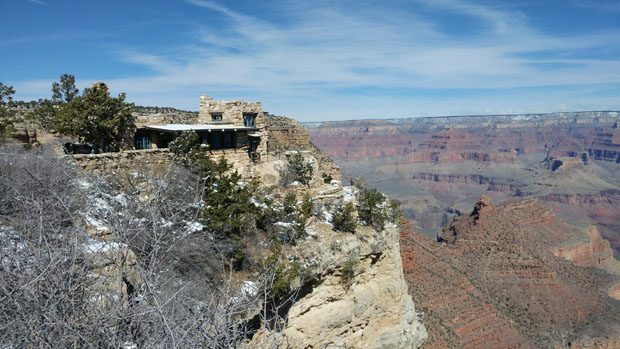 We walked along the Rim trail for a bit, and took the shuttle buses to various locations along the South Rim, checking out a couple of small museum, galleries and gift shops perched near the canyon’s edge. We still had 4 hour drive back to Las Vegas planned on the day, so we weren’t able to check out all the view points along the shuttle route to Hermits Rest, or do Desert View Drive. Grand Canyon is definitely a place I plan to visit again, and perhaps do a bit of hiking the next time I’m there. Our final stop of the trip is the Sin City itself, Las Vegas, Nevada. It has been more than a decade and a half since my family had visited Las Vegas. Back then I wasn’t even old enough to gamble, and also remembered that it was unbearably hot as we had visited in the summer. This time the temperatures were much more agreeable, and it was enjoyable to be out an about during day or night. 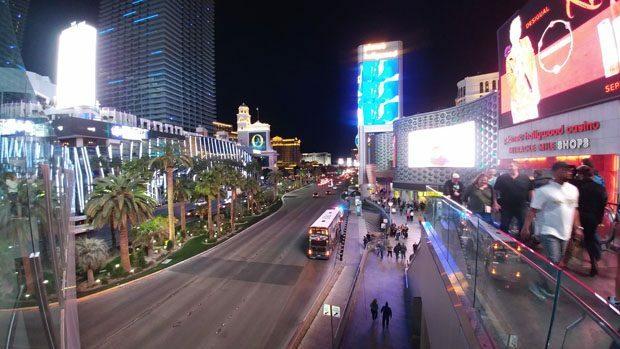 Most of our activities were confined to the Strip, which is the segment of Las Vegas Boulevard where most of the large casino-resorts are located. Las Vegas the city is much more than just the Strip, but the Strip is certainly the area where most of the visitors go. 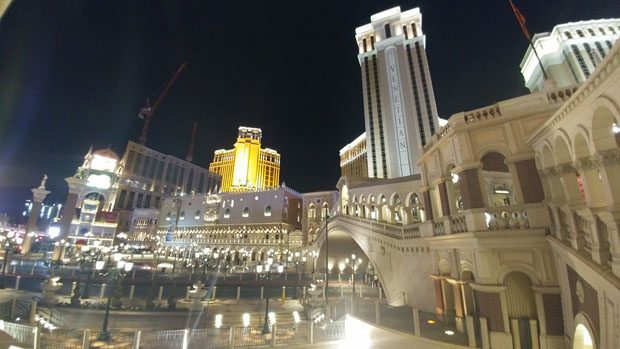 Compared to our previous visit, the Strip seems have gotten an upgrade, with even more glam and glitz, and a larger number of newer, more luxurious casino-resorts and shopping centers than before. We spent sometime walking up and down the Strip, and there were plenty of people doing the same. 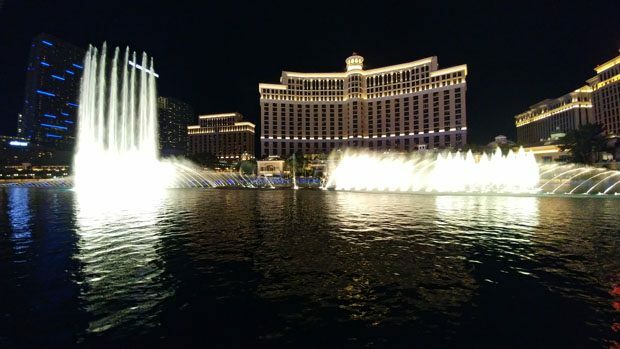 During the stroll, we stopped by to watch the Bellagio’s musical fountain show, which is still as entertaining as ever, and it’s one of the few things you to see for free in Las Vegas. 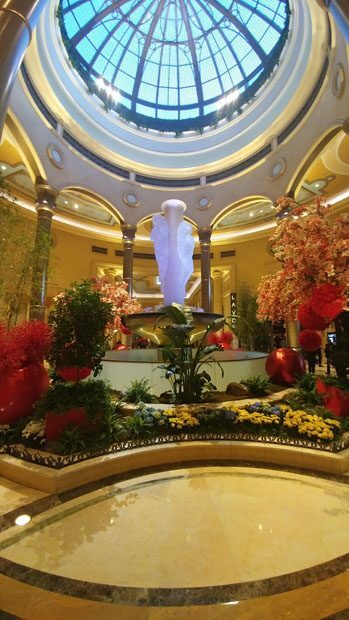 During this trip, we stayed at the Palazzo, which wasn’t around during our previous visit. The Palazzo and its sister property the Venetian combine to form the largest casino-resort on the Strip. The Palazzo is definitely one of the most luxurious hotels I’ve stayed in, with its regular suite being bigger in square footage than my own apartment. 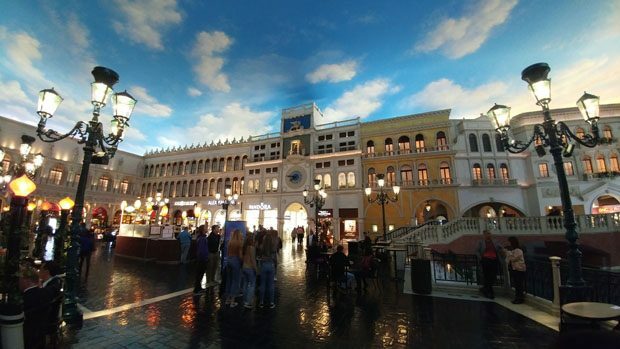 The shopping center between the Palazzo and the Venetian is also something to behold, as it is themed after Venice and even has a canal running through it where visitors can pay for gondola rides. Everything in the Strip is pretty over the top, and all of it is to entice people to spend more money. It wouldn’t be a trip to Las Vegas without a visit to a buffet. We weren’t in the splurging mood, so ended up going slightly off the Strip to the AYCE buffet at the Palms Casino for lunch. For $17 per person the food tasted pretty decent, and I definitely gorged myself. 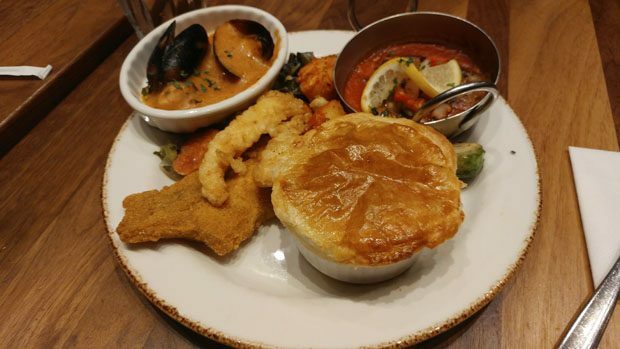 Since it was lunch, the prices were lower, but also meant that there were less seafood and other fancier items. I remember our previous trip to Las Vegas, my family had crab legs buffet for like $20 per person, but that was a while ago and things, especially crabs, have gotten more expensive since then. Las Vegas is of course the gambling capital of the US. My family and I aren’t really much into gambling though. We ended up losing $5 at the lots, and that was enough. Other than gambling and shopping, Las Vegas is also known for its shows. 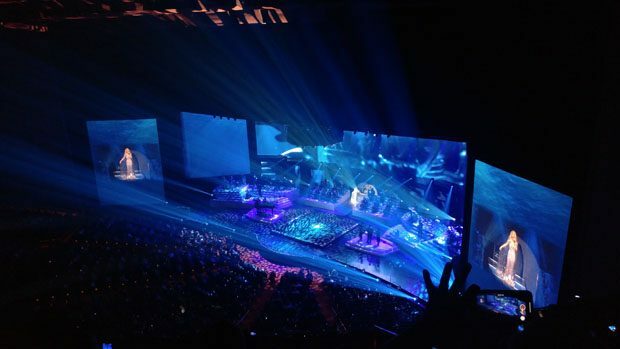 The highlight of our trip was attending Celine Dion’s concert at the Coliseum at Caesar’s Palace. Celine Dion is of course one of the most successful female singers of all time and has one of the most recognizable and powerful voices in the industry. She is ending her residency in Las Vegas this year, so we really wanted to catch one of her last shows. The thing about Celine Dion is that her singing voice in concert sounds exactly like what you hear from her albums or on the radio, which meant that the show was absolutely amazing. Hearing all of Celine’s hits performed live was incredible. This was probably the best concert I’ve been to so far. That was the extent of our trip to Las Vegas and the Grand Canyon. It was a pretty good trip, although I wished it could have been longer. In hindsight, I should have planned for an extra day so we could go see Antelope Canyon, but there’ll be next time. Part of this trip was actually paid for by by a sweepstakes I won. It was the biggest prize I’ve ever won from my sweepstakes-entering efforts, so I am obviously happy with that.